True Wins gives half credit for all close games, whether won or lost, since teams should win half their close games in the long run if they are truly decided by luck. For this post, I’ll consider all games within seven points to be close games. However, I didn’t have a good feel for how to evaluate or compare these stats. I found that Pythagorean wins and True Wins are more stable season to season than actual wins, but neither is highly correlated with actual wins in the future. I shared my findings with Aaron Schatz from Football Outsiders. He responded with a different claim that I had failed to test: teams whose actual wins are below their Pythagorean wins (i.e., unlucky teams) tend to win more in the future, while teams whose actual wins are above their Pythagorean wins (i.e., lucky teams) tend to win less in the future. This is different from saying that Pythagorean wins and future wins are correlated, which is what I tested. My Canadian friend Adrian gave me a good example that distinguishes between the two. Imagine that a team wins 10 games with only 6 Pythagorean wins and then wins 9 games the following year. Actual wins to future wins (10 to 9) will be more highly correlated than Pythagorean wins to future wins (6 to 9), but the negative Pythagorean win differential (6 to 10) could still help predict the one game drop, which is valuable information. 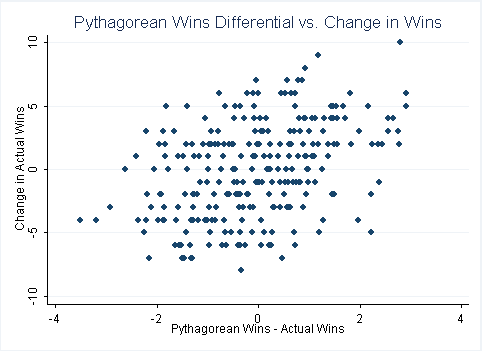 Pythagorean win differential is on the horizontal axis and change in wins from season to season is on the vertical axis. There is one point for each team in each season. The general upward trend says that lucky teams (fewer Pythagorean wins than actual wins) tend to win fewer games the following year, while unlucky teams (more Pythagorean wins than actual wins) tend to win more games the following year. The pictures are strikingly similar (True Wins can only be a whole number or a half, thus the neatly organized lines). It seems that True Wins and Pythagorean wins are capturing the same phenomenon. The numbers agree with the visual story. 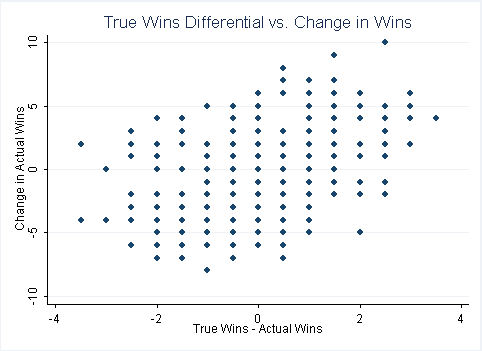 The correlation between Pythagorean win differential and change in actual wins is 0.40. The same correlation for True Wins is 0.45. Both plots support a regression line with a positive slope (statistically significant at far better than 1%). If you prefer percentages, 60% of teams with a positive Pythagorean win differential win more games the next year, while only 43% of teams with a negative Pythagorean win differential win more games. These numbers are even more convincing for True Wins (66% and 39%). I take two lessons from this exercise. First, it seems that I was wrong to dismiss this approach completely. Actual wins predicts the level of future wins just as well as Pythagorean wins or True Wins, but these stats may help us figure out the direction that actual wins will move. Second, True Wins is an able replacement for Pythagorean wins. True Wins is even more predictive (in this setting), and I maintain that it captures the Pythagorean intuition more clearly. I should note that actual wins also predicts change in wins (quite well, in fact). High-win teams win less in the future and low-win teams win more, on average. In a later post, I’ll try to estimate how much of this relationship is luck-driven (in the spirit of this post) and how much is explained by other factors, such as the reverse order draft. My guess is that True Wins/Pythagorean wins can help us figure out exactly which teams will follow the trend to the middle and which will fight it. This entry was posted in Commentary, Football, Gambling, Innovative Ideas, Sports Stats, Uncategorized and tagged Aaron Schatz, Adrian the Canadian, football, Football Outsiders, NFL, Pythagorean, Pythagorean expectation, Pythagorean exponent, True Wins. Bookmark the permalink.